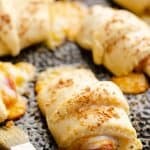 Hot Ham & Cheese Roll Ups are a savory recipe made with flaky crescents and topped with a zesty onion and butter mixture, perfect for a quick and easy 30 minute family-friendly dinner! Separate all of the crescents and top each one, on the wide half, with a slice of cheese and some ham. From the the wide end, gently roll each crescent up and place on a greased baking sheet. Microwave the butter and onion flakes in a small cup for 30 seconds. Brush the butter and onion mixture over each roll up. *If you are using regular crescents, you will need to reduce the baking time slightly.